Oftentimes, the word wasp incites fear and anxiety. However, many of Maryland’s 1,200+ wasp species are relatively small and docile in nature. One neat group is potter wasps; they serve as both pollinators and predators in the garden. Potter wasps are actually a large suite of species in the Vespidae family. 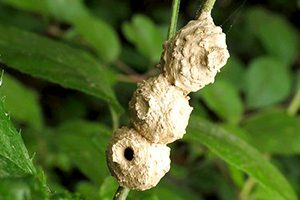 While other vespid wasps, like the bald-faced hornet and yellowjacket, are well-known for their social tendencies and tenacity defending their colonies, potter wasps are non-aggressive and solitary in nature. Several species of potter wasps can be found in Maryland, including the non-native European tube wasp (Ancistrocerus gazella). One of the more widespread and recognizable potter wasps is Eumenes fraternus, which is found throughout the eastern United States and Canada. Eumenes fraternus are small wasps that measure less than an inch in length. 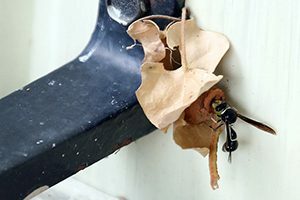 They have shiny, dark blue wings and a black-and-white banded body with a narrow waist (unlike bald-faced hornets which are large and relatively thick). After pupating, both the male and female E. fraternus will seek out nectar for food, picking up pollen and exchanging it along the way. Once the wasps meet, they mate and their paths diverge. The female soon begins sculpting mud into tiny clay pots, which will house her future young. On average, it takes the female 1-2 hours to assemble the nests. Nests are often placed on vegetation, or sometimes by windows or other human structures. They resemble tiny earthenware pots. Once she completes the nests, she hunts for caterpillars and other soft-bodied prey to paralyze and provision in the pot. As soon as enough food is acquired, she lays an egg, suspended above her caterpillar quarry, and seals up the nest to allow the young to hatch, eat and develop. The female goes on to make several other nests. While potter wasps are capable of stinging, they rarely do so. Females do not defend their nests, and often only sting if touched. 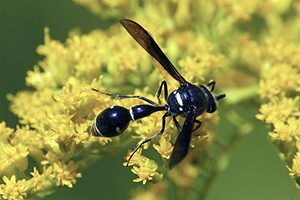 To attract potter wasps, consider planting goldenrods and other asters like late-season thoroughwort (Eupatorium serotinum) that often serve as nectar sources for adults. Click here to have HabiChat – the quarterly backyard wildlife habitat newsletter from the Wild Acres program – delivered right to your inbox!